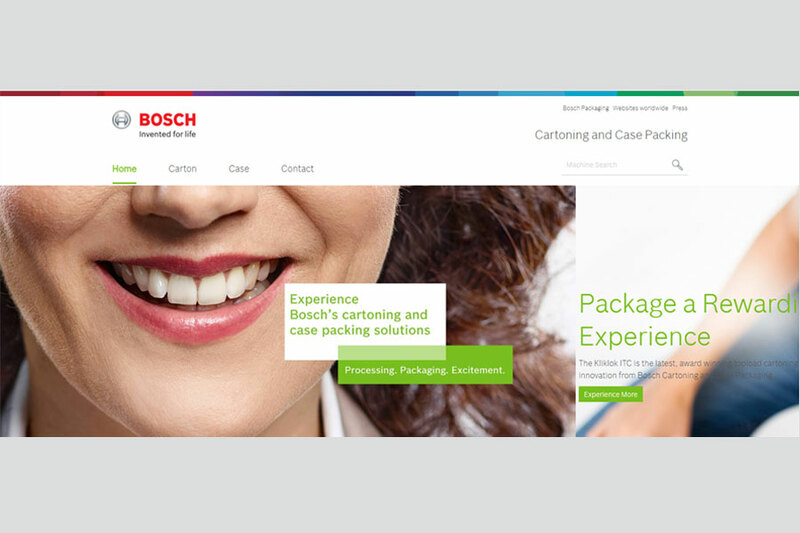 Animated packaging on the home page illustrates the broad range of secondary pack styles handled by the Doboy, Kliklok, Sigpack, and Elematic cartoning and case packing equipment. Customers can learn about Bosch’s topload carton formers and closers, integrated topload cartoners, horizontal endload cartoners, wraparound cartoners (sleevers), product handling machines, and sideload, topload, and wraparound case packers. By clicking on the animations, visitors are guided to the right machine via a carton size range and speed comparison. If customers already know what they want, they can jump directly into the machinery section and choose a specific machine or use the search function. The website is developed with a clear structure, focusing on the main benefits of each machine, the key features, product information as well as technical specifications, accompanied by appealing machine pictures. Embedded videos complement the content by demonstrating each machine’s functions. Visitors can also download the latest brochures.